The 27th February is International Polar Bears Day. You can help polar bears from your own home by changing a few lifestyle habits and getting active to help polar bears! If you've missed the 27th February, no matter - you can still start helping them from today! The main polar bear charity is Polar Bears International. Polar Bears International are based in the US and Canada but it doesn't matter where you are based - everyone can help polar bears with a few simple steps. 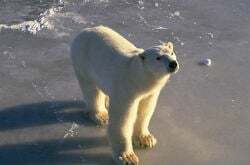 Polar Bears International are dedicated to saving polar bears by saving their habitat. Like many endangered animals, polar bears are under threat because of their homes being destroyed, lost, or taken over by people. The 27th February's International Polar Bear day is a great chance to put new lifestyle habits in place which will help preserve polar bear habitat. And Polar Bears International have a Save Our Sea Ice Campaign which focuses attention on the challenges polar bears face. Challenge yourself to make lifestyle changes to help polar bears! 10 Steps you can take to help polar bears - Make every day a Polar Bear Day! To save polar bear habitat, we need to reduce our greenhouse gas emissions. The way we use transportation, energy usage, and food production - all make a difference to polar bear habitat. Use natural energy wherever you can. Walk instead of taking the car where you can. Put washing out to dry on a line rather than using a tumble dryer. Put clothes in the sun to warm up. Try palm oil free chocolate and biscuits for example. Many products contain palm oil which means deforestation and rainforests are vital to the planet's wellbeing. Have a meat-day free day a week (or two or three!). The Vegetarian Society has stacks of recipes and advice to get you started. Re-use, reycle, reduce...... re-use, recycle, reduce - do you REALLY need what you buy in the first place? Buy locally or grow your own to save goods being transported. Adopt a polar bear from Polar Bears International.